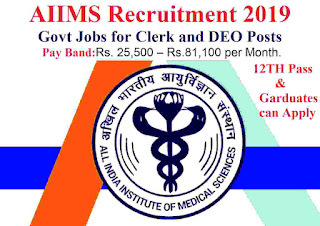 AIIMS Recruitment 2019 for clerk and Data entry operators on the regular basis under various pay level. An official notification has been published on the AIIMS Official website related to these Government jobs for clerk and data entry operator posts. So those who are looking for the Government jobs under clerk profession can apply for this AIIMS Recruitment 2019. AIIMS Jodhpur recruitment for clerk posts 2019. All India Institute of Medical Sciences, Jodhpur (Rajasthan) invites ONLINE APPLICATIONS for the various non-faculty post of the Institute on DIRECT RECRUITMENT BASIS. More information related to this AIIMS Recruitment process for clerk posts is given below in this article. The process for applying these Govt jobs for clerk posts will be online. So candidates can apply online through the official website of AIIMS Department before 27th Jan. 2019. We also shared the direct link for applying online under IMPORTANT LINK Section at the last of this article. Read it till the end carefully before applying online. Pay band: Rs. 19,900 -Rs.63,200 per Month. Pay Band: Rs. 25,500 – Rs.81,100 per Month. Those who have passed in their 12th class examination in any stream and must have computer Typing speed @ 35 w.p.m. in English or 30 w.p.m. in Hindi. Applicants who have passed in their 12th class examination in any stream and Should possess a speed of not less than 8000 key Depressions per hour for Data Entry Work. Paying Method: Candidates can pay the Examination Fee through Online Mode Only via payment gateway of AIIMS, Jodhpur. There is no offline method for the payment of the application fee related to this AIIMS Jodhpur recruitment for clerk 2019. 27TH Jan. 2019 is the Last Date to accept application. Disclaimer: We took this information from the official website of AIIMS Jodhpur whose link is as follow: “https://www.aiimsjodhpur.edu.in”. Inside this website we found the official PDF file whose link we share under IMPORTANT LINK section above under Advertisement Here Link tab. So all the rights of the information which we shared in this article goes to AIIMS Jodhpur website.